I wish I could say that if you follow my directions, you will achieve beautiful macarons each and every time, but I can’t. There will be times that the same cookie sheet will have perfect macarons and less than perfect macarons. My advice is to just go for it. They all taste fabulous, so you really can’t lose. I have made a list, in no particular order, of some things that might help make the process a little easier. Sifting: Always weigh your ingredients before sifting. It is important to sift your dry ingredients to achieve smooth macaron shells. If you end up with more than a teaspoon of almond meal in your sifter you will need to sift more until you have the proper weight. Not all almond meal brands are created equal. If your almond meal is a little chunky you might want to pulse it in a food processor before sifting. Egg Whites: I usually use pasteurized egg whites because I think they are less expensive and I don’t have to find something to do with the egg yolks. If you use regular eggs, you don’t need to age the egg whites. I haven’t noticed a difference if my egg whites are straight from the fridge or at room temperature. Oven: All ovens are different and most aren’t very accurate. I recommend getting an oven thermometer and checking your oven before you begin. Mine was off by about 10 degrees. I asked my bff (Google) how to calibrate my GE oven and, true to form, she pointed me in the right direction. It was amazingly simple!! I have no experience with Convection Ovens, sorry!! Weigh or Measure: When I first started reading about making macarons, everything I read said to use a scale for the best results. I believed what I read, rooted around for a Bed Bath & Beyond coupon, and bought a digital scale. I have come to love using a scale and wish more recipes were written with weight measurements. 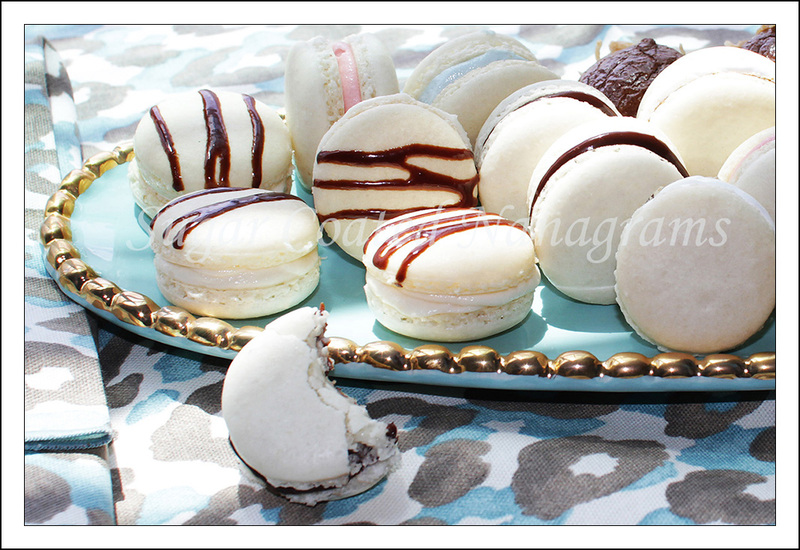 Meringue: The meringue is one of the most important parts of making successful macarons. You need to beat, beat, beat and then beat some more. My recipe requires an almost stiff, dry meringue. It will take you about 10 minutes to achieve the proper volume. If your recipe calls for a soft meringue, follow those directions. Macaronage: Macaronage is the term used for the technique used to mix the batter. This is the second thing that is extremely important for successful macarons. In my video I show the method I use for incorporating the dry ingredients into the meringue. Basically, all you are doing is folding and smearing the batter on the side of your bowl. Make sure that there isn’t even one speck of white meringue left on the sides of the bowl or running through your batter. You want the end result to flow off your spatula like lava or thick pancake batter. It goes from too thick to too thin very quickly. Once you have incorporated all of your batter into the meringue, check every stroke or two to see if it flows. You can recover from under mixed batter but if it’s over mixed you will not get cute little cookies. They will still be delicious but they won’t look like you want them to look. When you drop a bit of the batter onto itself it should melt into the batter in about 20 or 30 seconds. Piping: I made a template, on parchment paper, to help keep me focused while piping. Without it, I consistently make bigger and bigger shells. It’s not the end of the world but the presentation is best when they are similar sizes. It’s also easier to match them up if they are all the same size. I saw a printable template someplace (probably on Pinterest), but I made my own with a medicine bottle (about 1 1/2) and parchment paper. If you use a dark marker you will be able to see it through parchment paper or a silicon baking mat. 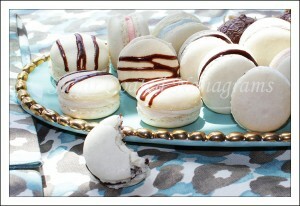 Time to “Rap” It Up: Once you have piped your macarons onto your cookie sheet, pick it up and rap it on the counter. Don’t be shy with this step. Give it 3 or 4 good, solid whacks. You want to bring any air bubbles that are in the cookies to the surface. Use a toothpick to pop them. 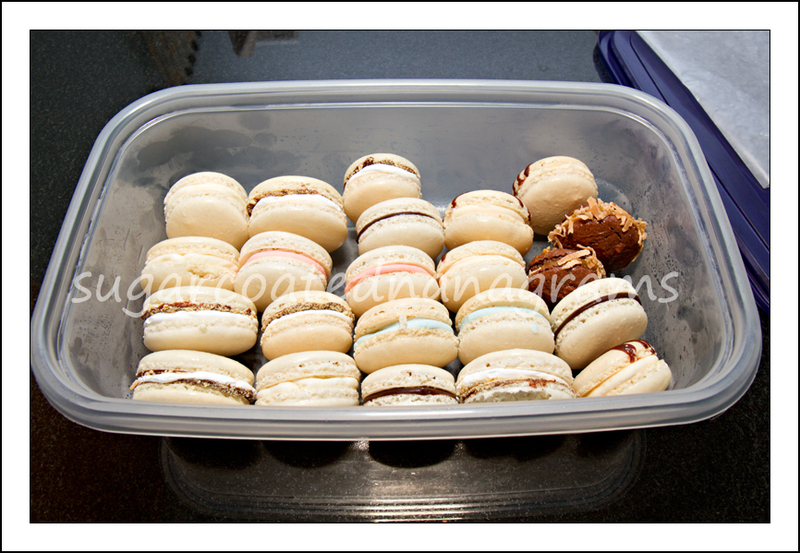 Serving and Eating: Once you have filled your macarons; put them in an air tight container and store in the refrigerator. They take at least 24 hours to mature. I have read some recipes that say to let them mature for a week. Your macarons will benefit from the maturing process, whether it’s 1 day or a week. Making in Advance: Macarons last for an incredibly long time when stored properly. They freeze beautifully, either filled or unfilled. I learned the hard way that the best way to store macarons are either in a single layer or on their sides. If the macarons are filled, I put them on a cookies sheet until the filling is set. Once the filling is set you can stack them on their sides, in an airtight container, and refrigerate or freeze.